Leroy played for the Broncos in the 2014 season. In 16 games played, both league and tournament he scored 118 points. On offence he was the first to be picked out by the opposition as the man to cover. With his ability in the air, it was a tough task for any DB. On defence, opposition quarterbacks quickly learned not to throw the ball to his half of the field, but he still managed a haul of interceptions. 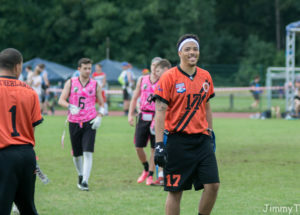 Leroy, who hails from Holland, was invited to join the Broncos when he was approached by Jimmy and Fraser at the European Championships in Pesaro, Italy. Realising that he was coming to Stirling University for a year meant, the Broncos were his local team. Over the years since he moved back home, he still meets up with Broncos players at some of the bigger tournaments in Europe.